Churchill Fulshear, namesake of the community and one of Stephen Austin�s �Old Three Hundred� had a plantation near present-day Fulshear prior to the arrival of the railroad in 1888. 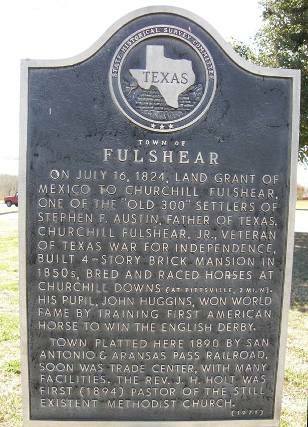 Fulshear�s son, also named Churchill, granted a right-of-way to the San Antonio and Aransas Pass Railroad (the SAAP) that year and the new town of Fulshear was platted in 1890. Fulshear drained population from the existing community of Pittsville when that town ignored the railroad and paid dearly for the slight. A school district was formed in 1893 and a Methodist church was established the following year. The population reached 250 people by 1898 with most essential businesses being established � including a hotel. The town was dealt a severe blow in 1910 in the form of a downtown fire but recovery was swift and the town prospered as never before. By 1929 Fulshear�s population topped 300 residents, served by 10 stores. By the early 1930s, Churchill Fulshear�s Plantation home was demolished, breaking its oldest physical tie to the past. The population declined by 2/3rds and it never reached 300 again until Houston started growing toward the town in the 1970s. By 1988 the population had increased to 623 but after a slight dip in the 1990s, it grew to just over 700 for the 2000 census. On July 16, 1824, land grant of Mexico to Churchill Fulshear, one of the "Old 300" settlers of Stephen F. Austin, father of Texas. Churchill Fulshear, Jr., veteran of Texas War for Independence, built 4-story brick mansion in 1850s, bred and raced horses at Churchill Downs (at Pittsville, 2 mi. N). His pupil, John Huggins, won world fame by training first American horse to win the English Derby. Town platted here 1890 by San Antonio & Aransas Pass Railroad, soon was trade center, with many facilities. The Rev. J. H. Holt was first (1894) pastor of the still existent Methodist church.